Local musical and artistic talent can really enhance or destroy a coffeehouse. I've been to great coffeehouses with horrific musical acts that sent my ears pulsating and my coffeehouse experience lacking. Yet a good musical act can sometimes make the worst coffeehouse seem like a gem (though sometimes that isn't good, especially when a coffeehouse abandons their coffee passion only to be a music venue). Anyway, I recently made a stop with my bride in a small upstate NY town called Baldwinsville and lo and behold, there happened to be a coffeehouse called Shamballa Cafe and Coffee Roastery open with some live music inside. At the time, we didn't have many other ideas of things to do so we parked and sauntered over. 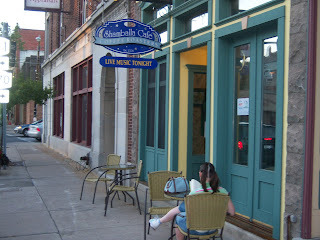 The exterior of Shamballa consists of a small front with a few outside tables, with a front and back entrance (the back entrance leading to a parking lot). Walking in, the shop unveils as a long space with lots of tans, greens, and salmon colors as well as a curtain wallpaper (while a bit 3D-ish, also a bit tacky). The shop also has a moderate amount of tables, a couch area in the back, and the live music to the left as you walk in the front. According to their website, Shamballa actually sprouted out of a home-roasting habit of the owners and apparently blossomed into the coffee roastery and cafe. I purchased a cup of the Ethiopian Standard, which provided a decent cup of coffee with a slight brightness but an underlying char. The espresso operation seemed to be fair at best. While I watched the barista pour a fairly poor latte, the espresso accordingly was pulled not so badly (they had quite an interesting tamper) though a little long for my tongue. The espresso came off brightly with a smooth acidity, though also a bit sharp in taste. The tea is Republic of Tea. Going back to the live music, the artist on stage while I was there was actually very conducive to the environment and proved to really enhance my experience. In regards to Shamballa itself, I would have to say the coffeehouse shows some promise but at the same time, a bit of lack in a few arenas. Nonetheless, the coffeehouse definitely provides a welcome watering hole amidst the town so if you're ever in the area, make sure to pop in.